COMMENT & ANALYSIS: An elected councillor who is objecting to a cycle route from Amiens St to Clontarf in Dublin is a serial objector to cycling projects. This isn’t just our opinion, he has objected to more than three cycle routes — that qualifies as a serial objector. The independent councillor Nial Ring is a businessman and also a former IFSC banker. He is described in one article as one having being part of “Bertie Ahern’s St Luke’s inner circle” and has reported links to oil companies. The Irish Times reported last year that Cllr Ring “has said he made a ‘reasonable profit’ from trading in the shares of three publicly quoted companies that have racked up losses of approximately €7 million between them.” The oil company is US Oil & Gas, on their website he is listed as “a former director”, while The Irish Times were were also reporting on non-oil companies Proventus Renewables and IMC Exploration. 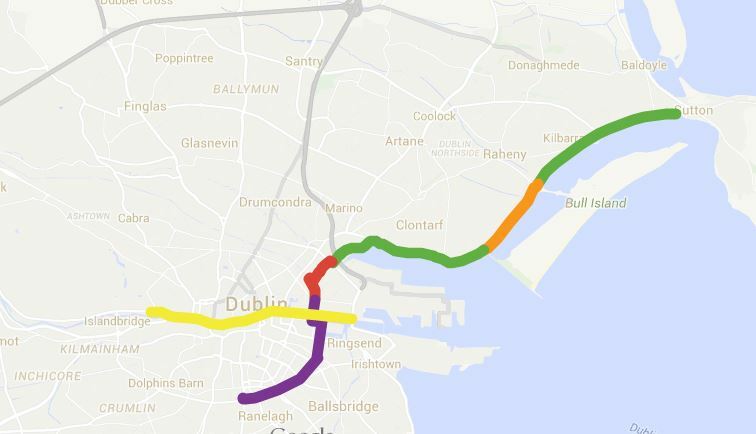 On plans for the Clontarf to city centre cycle route, Ring was critical of a short section where there is only planned to be a single general traffic lane in the northbound direction where the roadway is confined at a railway bridge. There is already only a single lane southbound. The design, however, is far from final — the draft drawings note: “Amiens Street / Railway bridge options to be confirmed”. If his problem was just this pinch point, he could have called for alternatives such removing a small railing outside a shop, which might allow for space for both a cycle path and the footpath on the shop side of the railway bridge support. This would allow for the retaining of three traffic lanes, as there currently is. But instead Ring opted for rhetoric. Cycling in reality has many mental and other health benefits, and it is the best chance of keeping the city moving. Reallocating limited road and street space to cycling allows more people to travel than if that space was, for example, just a general traffic lane. Ring also called the Liffey Cycle Route “madness”. He was reported as saying so by the Irish Independent and by the Dublin People, a local newspaper. He told the Dublin People that: “I am not anti cyclist but I have sympathies with motorists who are being targeted all the time, yet these are the people who pay road tax and exorbitant parking charges when they can find a place to park in the city, yet are rarely seen breaking red lights or indeed driving on footpaths.” IrishCycle.com can confirm that there is no such tax as “road tax”. Council records show that Ring was one of the councillors who objected to the original S2S Dublin Bay cycle route connection from Fairview to the Liffey, via the Eastwall area. If that key section of the Dublin Bay route went ahead there would have shortly been nearly an 11km route between Howth Head and the River Liffey. This would tie into a 4km route already in place to Rathmines along the Grand Canal, which will be linked to a route to Adamstown. If he is referring to the Phibsborough road and Drumcondra section, he may have a point on this one. All users would be better served if the already busy north bank on this section was reserved for walking and running, while the south could be mainly but not exclusively be for cycling. This approach would not cost much or any more than the current plan. But Ring’s public stance on cycling projects does not seem like he is up for reasoning. Any move to more a more accessible, healthy and sustainable city which takes space from current use is treated as “madness” or “absolute madness”. People ask us what stops progress on making cycle routes which are safe and attractive to people of most ages and abilities, part of the answer is councillors like Cllr Ring. He, however, may be just more upfront in his objections than some of his fellow councillors. Cian Thanx for giving the background on this Niall Ring. After reading the disappointingly one sided article by Olivia Kelly in the Irish Times, I wanted to check his background and complain to Olivia Kelly about her ‘lazy journalism’, where she doesn’t even appear to have contacted any representative with an alternative view! Certainly no one in tha active cycling community was contacted! This is not an easy route to get right, but we must critique it fairly! Thanks for the update Cian. In time to come all these guys will be remembered by history for the dinosaurs that they are, that is if they are remembered at all. The real power in the council is the county manager. If he/she wants to put something in place, that’ll be what will happen. You can really ignore these “empty vessel” politicians and journalists. Unfortunately, these people don’t always do the right thing anyway. I agree with Colm’s view above. The Irish Times has too many different staff writing about cycling issues and there is no consistency in ‘corporate’ viewpoint. Health, economic and environmental aspects of cycling in relation to pressing need to decarbonise the Irish transport system never are mentioned. But more importantly why are we never asked for an opinion on serious matters like this? And why are the two key Cllrs who chair the Planning and the Transportation SPCs silent on all these issues? “yet these are the people who pay road tax and exorbitant parking charges” – these are not admission fees, that entitle a service. They are deigned to discourage the behaviour in the first place. Thanks for that observation Colm Moore. The ‘charges’ are designed to make people who insist on being able to roam anywhere with their wheeled metal box think about the wider societal implications of what they are doing. I too am a car driver but that doesn’t give me the right to use it in any way I choose. We have to distinguish between car ownership and car use. We have a wider duty to the public good. @Mike McKillen. Mike, We spent a long time discussing the proposal at our Central Area Committee on 14th July 2015. I raised concerns about the loss of mature trees on the route, and emphasised the need to have the best route for cyclists. At that time I hadn’t known that the original proposal was for a segregated route. I wasn’t present at the joint meeting held on 28th July. I hope to go to a second meeting that will be held on 8th September. I’m not sure if it will be useful to attack colleagues on the Council, we are probably better of discussing how to get the best outcome in the route. I’d welcome any guidance from the Dublin Cycling Campaign or others on what can be done to modify the plans at this stage. “rarely seen breaking red lights or indeed driving on footpaths”. I will call him out on this, as a driver and cyclist in Dublin that statement is simply not true. Drivers consistently break red lights and park on footpaths (and cycle paths). Of this I have evidence too. Search “Cycling Dubliner”. Ring sounds like a plonker and I sincerely he, and others orientated like him, fail to be re-elected next time round. Thank you Cian for sharing this.